This is a huge file so I apologize if it takes a million years to open up... wouldn't blame you if you don't stick around to see it although I think it's worth a look. 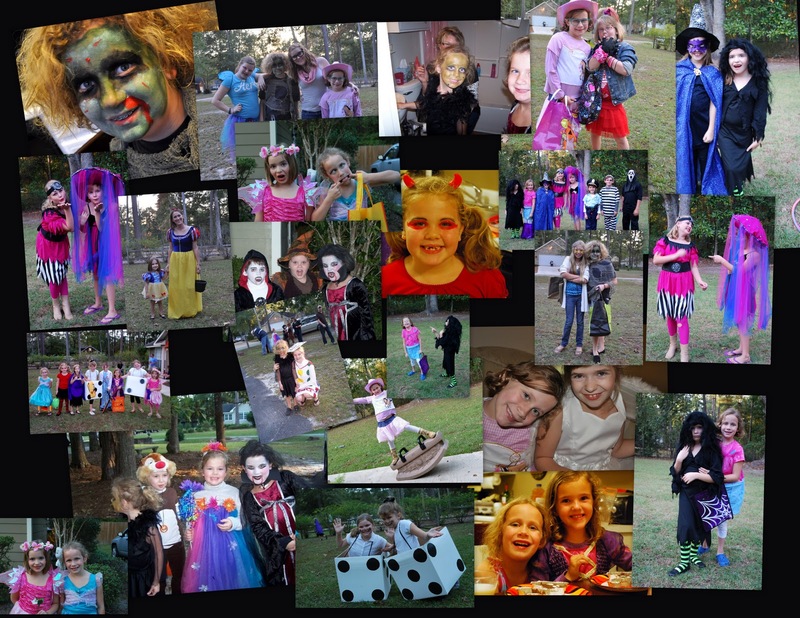 This is the past four years of Trick or Treating at our place, I think it's neat to see the kids growing up a little more each year. It seems there's a good mix of ghoulish and non-scary costumes going on, there's a zombie, vampires, fairy princesses and jellyfish in there! We usually have a party and I cook a big pot of chili and we invite friends to come and join us in our neighborhood, it's always been a great place for the kids to walk around gathering their goodies. This year though I wanted to keep it a low key because quite honestly I'm exhausted... and the house is a mess... and it fell on a Monday which is not exactly famous for being the best party night of all the nights of the week. So the girls had just a couple of the usual friends come over and they set out with Daddy while I sat there and gave out candy until thankfully it was all gone and I could turn off the porch light and wait for their return. It seemed to be pretty busy this year though, more little Spidermans than you could shake a stick at. Urghhh... am I just getting old? I can't wait until the girls don't want to do it anymore but I have a feeling that's a long way off. They love Halloween, they have both said it's their favorite day of the year... can they really love candy that much??? I guess so!!! Great collage. Loving the Pair of Dice! There are some labour-intensive aspects of motherhood that I won't miss -- the endless ferrying about comes to mind -- but Halloween I love. Even after we moved to England, we've done our best to keep the traditions (often including a big pot of chili) going.